Increasing interactions between deer and various properties on and around Cornell University lands have resulted in the need to implement and evaluate a deer research and management program to reduce negative impacts. Discussions and actions regarding deer damage management reflect the University’s goal to maintain the integrity of Cornell lands, while being cognizant of related neighborhood impacts. The project will be implemented in an effective and cost-efficient manner, for the primary purposes of supporting the research, teaching, and outreach functions of Cornell University. For this project, Cornell lands have been divided into two zones: a core campus area and outlying areas adjacent to the core campus (see ). The primary objective for the core campus zone (1,103 acres) is to reduce deer damage to unique plant collections or research plots, and minimize safety risks associated with deer. We plan to monitor complaints about deer damage to plants, reported deer-vehicle accidents, and deer abundance. The goal is to reduce deer associated complaints. The outlying areas comprise a zone (3,865 acres) that contains agricultural fields, woodlots, and natural areas. Limited hunting has been allowed on most of these properties for decades. The primary objective for these areas is to reduce deer damage to agricultural fields and natural areas through the use of controlled hunting on areas with safe shooting zones that meet state discharge regulations (see deer hunting link). The focus will be to increase the harvest of female deer and lower the reproductive potential and herd size near campus in areas that can be safely hunted. Close to campus, archery hunting will be the primary approach. Where practical, shotgun hunting will be permitted based on input from the Cornell University Police and land managers. After seven years of implementing a deer fertility control program in the core campus area, there was no change in deer abundance (see report, IDRM 12-11-14 Final). Consequently, we are using a NYS Department of Environmental Conservation Deer Damage Permit on the core campus. Deer are removed using archery equipment and bait by selected volunteers. During the initial two years of the program, deer abundance was reduced on campus by 55%, from just over 100 deer to less than 50. We will continue these efforts and monitor associated deer impacts. In conjunction with the deer damage program, deer abundance will be ascertained by baiting them into sites monitored with infrared-triggered cameras. 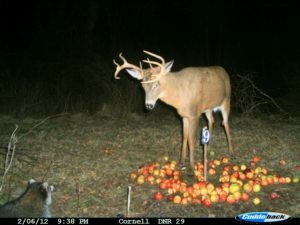 Sites will be baited during about two weeks in late winter, and numbers of deer in these photos will be determined. Computer models will be used to estimate population size from these photographs. Data will be collected on behavior and survival of the remaining tagged deer. We welcome discussions about the research with residents in the surrounding communities. We would be glad to schedule presentations about the project, or deer management in general, for interested community groups. Please contact Cornell’s Office of Community Relations at (607) 255-4666 or gjs28@cornell.edu if interested. Cooperating private landowners have provided access to locations desirable for deer capture or photo surveys. With permission, research staff will dispense bait at the desired site, set up equipment, and continue to bait and monitor the site throughout the trapping season. Community members can help researchers locate deer and determine activity patterns. Important information to record includes the date, time, street address, tag numbers of marked deer observed, and total number of deer in the group. Please report sightings by email at: mla14@cornell.edu. It’s anticipated that this innovative program will provide vital information on the ability to manage deer populations on Cornell lands, and the surrounding residential community, using the integration of a deer damage permit and controlled hunting. Furthermore, the results of this research could provide a long-term approach to managing deer or other wildlife populations. Final Note: If there is an emergency with a tagged deer, contact Cornell Police at (607) 255-1111.